The Kingsbury Manx - Ascenseur Ouvert! Please support the CVR blog, can someone, somewhere buy anything?? New York, N.Y. In a career that now spans two decades, New York duo Maura and Pete Kennedy have traversed a broad musical landscape, surveying power pop, acoustic songwriting, organic rock rooted in their early days in Austin, and a Byrds-inspired jangle that drew the attention of McGuinn, Steve Earle, and most notably Nanci Griffith. The duo co-produced Nanci’s latest CD, and are currently touring the US and the British Isles with the Texas songstress. Alan Harrison of Made in Newcastle said "Opening act, the Kennedys, had a nice line in Country-folk with a quaintly English edge to it and songs like When I go and The Midnight Ghost, won them plenty of new fans, as was witnessed by the long queue buying up their CD’s at the intermission." On their new release, Closer Than You Know, out on August 21, 2012 via Burnside Distribution, The Kennedys strike out into new territory, this time inspired by a sojourn in Paris, where they immersed themselves in the turn of another century, the time when Debussy and Ravel were inventing the sonic palette of modern music. No strangers to reinvention, Pete and Maura came up with a cappuccino-fueled concept at a small café in Montmartre: music inspired by the Impressionist composers, married to the rock and pop sounds for which the duo have long been known. In the spirit of Paris-trained composer Burt Bacharach and his lyricist partner Hal David, Pete took on the task of creating musical landscapes that would cushion Maura’s lyrics and bell-like harmonies. The songs have a quality, inherent in Maura’s voice, that is both soothing and urgent. As writers and producers, the Kennedys continue to mature, from their early style-conscious pop to today’s burnished sheen. Always tuned to their own muse, Pete and Maura have once again come up with a unique sound that is as uplifting as it is unclassifiable. 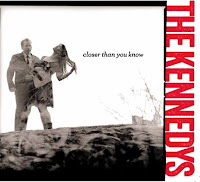 The Kennedys will be in the UK touring with Nanci Griffith again this summer, and will be doing several U.S. shows celebrating the release of Closer Than You Know . Grizzly Bear have just revealed that their new studio album will be called 'Shields,' and it is slated for release via Warp Recordings on September 17th in the UK and September 18th in the US. The band will tour the UK in support of the album in the autumn, with dates booked in both August and October. Iron Maiden Guitarist Solo Album Coming? Iron Maiden guitarist Adrian Smith says he's considering releasing the instrumental album. In an interview with Braveword, the guitarist stated that the album - a collaboration with a keyboard player - was a lot of fun to record, and may possibly be released someday. However, for right now, his focus is divided between Iron Maiden and his new band, Primal Rock Rebellion, which snowballed from two song demos with SikTh singer Mikee Goodman into an entire album. "It has a life of its own," Smith said of his side band. "I ended up writing with [Goodman], but I didn’t know that it was going to turn into an album. If anything, it was more his solo album to start with me producing and writing, but then it became more of a joint project. It just sort of grew really." "A Time Of Crisis", the comeback album from U.S. power/thrash metal act HERETIC, will be released on July 26 through Metal On Metal Records. 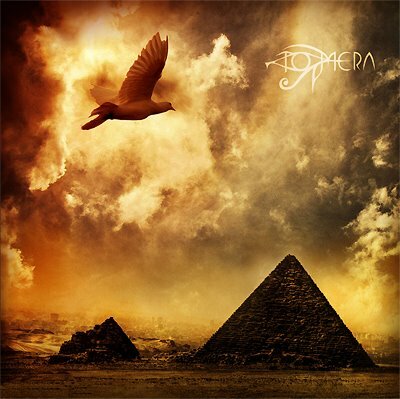 The band stayed true to its roots and created a really solid CD in the best U.S. metal tradition: heavy, melodic and aggressive. 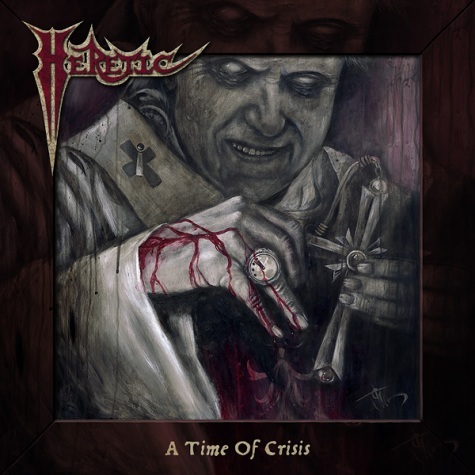 The cover art for "A Time Of Crisis" was created by a tattoo artist Tom Berg.